In no other place in the United States is climate change already causing such drastic alteration of the ecosystem, society, and the economy than in the Arctic. In addition to direct climate change impacts such as coastal erosion, loss of sea ice, and increased storm surge, climate change is enabling development of new industries that—without proper management—may further impede this stressed human and ecological system. While subsistence communities have adapted to fluctuations throughout their history, the Arctic is now changing at an unprecedented rate and magnitude that is threatening their way of life. There are myriad research needs associated with climate change, from information on ocean currents and wind patterns to migration trends and animal populations. However, perhaps the most pressing research need is strong communication between researchers and coastal communities, to optimize research project conception and design, implementation, and results dissemination. In partnership with the Alaska Eskimo Whaling Commission, the Environmental Law Institute has worked to increase understanding of how communication occurs between researchers and coastal communities during research focused on the Alaskan marine environment. We focus especially on research related to the management of marine subsistence resources, including questions about climate change and its impacts. Our goal was to understand what processes should be used to guide research project design, implementation, and information dissemination so that it incorporates the knowledge and input of coastal communities and benefits them over the long term. The following report and executive summary contain our key findings and recommendations, which agencies might use to guide the research they undertake, fund, and otherwise support in the region. 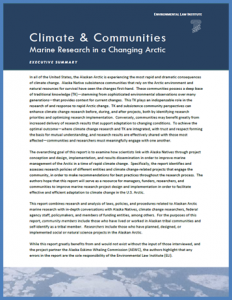 It is our hope that this paper will serve as a resource for researchers and communities to collaborate in the research process; will improve project proposal and design; and will ultimately lead to improved practices related to communication and engagement between researchers and Alaska Natives in order to facilitate effective and efficient adaptation to climate change in the U.S. Arctic. We welcome any and all suggestions and input on the report and executive summary. They are “living documents” and we will update them periodically, as appropriate, based on feedback received. We welcome feedback through the form below, or you are also welcome to contact us individually at any time. All comments will be kept confidential. 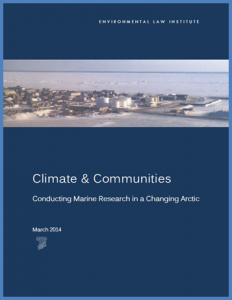 This Report is built upon research and in-depth discussions with Alaska Native community members, researchers that conduct marine research in the U.S. Arctic, staff from federal agencies that support such research, and others. Although we keep input and comments anonymous, we wish to express our gratitude to all who provided information, offered suggestions, and reviewed materials. In addition, we appreciate the funding from the National Oceanic and Atmospheric Administration that made this effort possible. Any mistakes or errors in the Report are the fault of the authors alone.